Saturday May 6, 2017 celebrate motherhood by spending one-on-one time with your child & have those moments documented in a series of beautiful, bright and airy lifestyle photos. Hi there, thank you so much for stopping by! Unfortunately, all spots for the Motherhood Mini Sessions are now full. You can still scroll through to learn more about these sessions. If you don't want to miss out on future events like these, be sure to sign up for our Sunday Kind of Love monthly newsletter where you'll get free family and home inspiration plus exclusive first access to news and events. There's nothing that inspires me more than capturing the bond between a mother and her child. It warms my heart when I see moms snuggling and giggling together with their children, how full of love their eyes are when they look at their little ones and the way their little ones adore them right back. So many mamas tell me their babies grow too fast and though they have tons of baby photos on their phones, how they wish they had more pictures of them spending time together. On Saturday May 6, I'll be collaborating with Julia Salk (more about her below!) to host mini photo sessions in a beautiful, rustic setting just for mamas and their children to celebrate those sweet motherhood moments. These sessions are not posed - don't worry about looking at the camera or getting that perfect smile. There will be no expectations other than for you to show up and be present with your child while surrounded in an intimate space with natural light all around you. 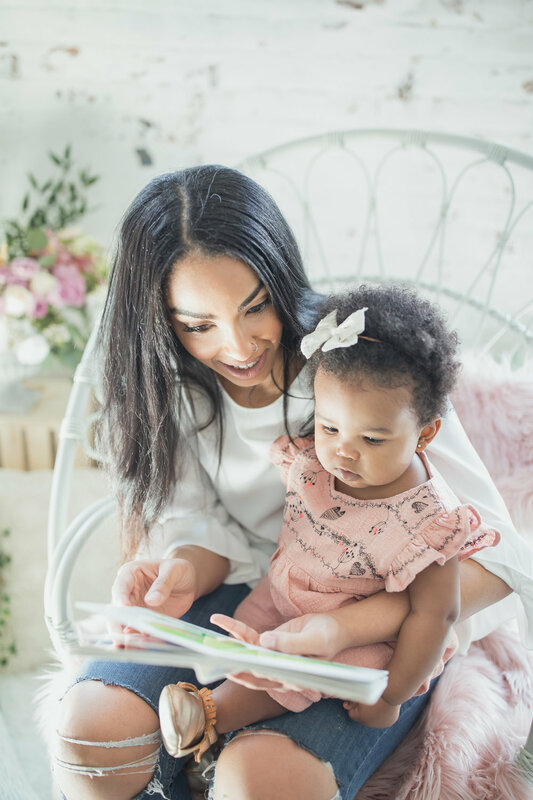 Hug, kiss, sing, dance, tickle, talk about your plans for the weekend or tell your little ones stories about when you were little - these sessions are all about your love for each other and whatever you're feeling in that moment. Sessions are for mamas (or expecting mamas) and her child or children. If you are interested in a family session, you can ask me about scheduling a day-in-the-life family portrait session. Sessions are held in a charming historic building right in the heart of the Distillery District complete with white brick walls, lofty windows and soft natural light. I'm so excited to be partnering with Julia Salk who'll be creating a magical and intimate set especially for this event. There will be florals, shabby chic elements, soft throws and pillows for you to relax and spend time with your children. Address and full details about how to get into the building will be emailed to you about 1 week before the event. Follow our Motherhood Minis mood board for a sneak peek of the loveliness we are planning. You'll receive a guide for what to wear including recommended colours and other tips to prepare for the sessions about 3-4 weeks before the event. Saturday May 6, 2017 between 11:00 a.m. and 3:00 p.m. Sessions are up to 20 minutes long and are booked back to back. For that reason, I will not be able to extend your time if you arrive late to the session. Please plan to arrive 10-15 minutes before your session starts so you can find your way into the building and get settled in. Spots are limited and booked on a first come, first serve basis. How Much are Sessions & What is Included? A $50 non-refundable session reservation fee is required to book your spot, the remaining amount ($149) is due on the day of the session. Spots are limited and booked on a first come, first serve basis. TO BOOK: Select a time from the drop down below and when you are ready, click the "Reserve My Spot" button below to check out. There are no refunds for the reservation fee due to the limited number of sessions available. If you miss your session for any reason, your reservation fee can be used toward a full family session at a later date. If you have more than one child and wish to reserve a dedicated session time with each of them, you may wish to purchase two sessions back to back. Please contact me for more details.